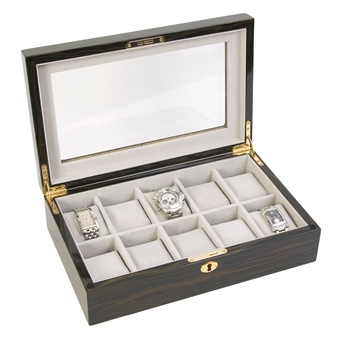 Top design, this locking wooden watch box features display window and storage for 10 watches. Best selling design in a high-gloss ebony wood, this watch box is a great gift for that those who take pride his/her timepieces. A lined silsuede interior & brass key complete this beautiful collectors case.